Isotype (International system of typographic picture education) was a method for assembling, configuring and disseminating information and statistics through pictorial means. Its initiator, Otto Neurath, described it as a 'language-like technique' characterised by consistency in the use of graphic elements. The basic elements are pictograms - simplified pictures of people or things, designed to function as repeatable units. From its beginnings in Vienna of the 1920s, Isotype spread to the Netherlands, Britain, the Soviet Union, the United States and elsewhere. Its potential for communicating with people of all ages and nationalities was explored in a wide range of projects and publications through the 1960s. The story of Isotype presents a case study of the Modern Movement. It also reveals a pioneering method of visual communication that has exerted an undeniable influence on the design of information. The principal rule of Isotype is that a greater quantity should not be represented by an enlarged pictogram (chart 1, below) but instead by a greater number of pictograms repeated at the same size (chart 2). 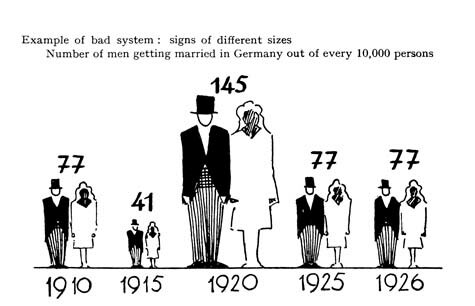 Otto Neurath was the leading figure of Isotype. He was a polymath whose lifetime of work encompassed political economy, sociology, philosophy, urbanism and visual communication. In the early 1920s he was involved in the Viennese settlers' movement. From this grew a housing museum, which Neurath then developed into the Social and Economic Museum of Vienna. Here he became fully engaged in the use of visual methods for explanation and education. After the brief civil war in Austria in 1934, Neurath settled in The Hague, having already established there an International Foundation for Visual Education. In 1940 he fled from the German invasion of the Netherlands to Britain. Two years later, alongside Marie Neurath, he set up the Isotype Institute in Oxford. Marie Neurath (born Reidemeister) worked at the Social and Economic Museum of Vienna from its beginning. She was the principal 'Transformer', a role that prefigured the modern information designer. It was her responsibility to analyse raw data and put it into picture form ready for final production by graphic artists and technicians. Around 1935, she invented the name 'Isotype'. She worked with Otto Neurath in The Hague and escaped with him to Britain, where they were married in 1941. 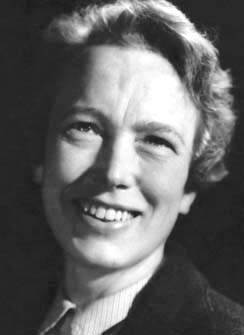 She continued as director of the Isotype Institute after his death, and in the 1950s and 1960s became a prolific author (as well as designer) of children's books on science and history subjects. Gerd Arntz, c. 1930s. Photograph by Wolfgang Suschitsky. 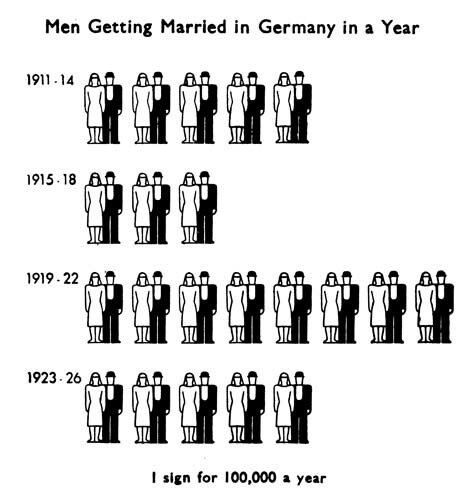 Gerd Arntz gave Isotype its distinctive graphic style. 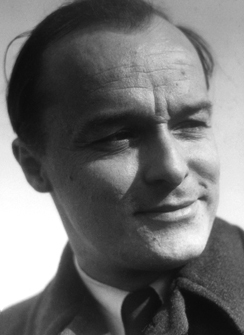 He was associated with communists, the left-wing press and socially committed artists. He chose the woodcut as his principal technique for making artwork because of its primitive strength and reproducibility. On seeing some of Arntz's work in an exhibition, Otto Neurath immediately recognised its suitability for Isotype. He then asked Arntz to collaborate with the Social and Economic Museum of Vienna. Arntz went to work there in 1928 and established the linocut as the museum's means for producing pictograms. Arntz joined Neurath and Marie Reidemeister in The Hague and remained in the Netherlands, where he continued to work on pictorial statistics.